Cape Town - South Africa's Hilton Langenhoven has won a silver medal in the men's 400m T12 final at the London Paralympic Games on Thursday evening. 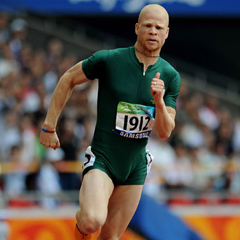 Langenhoven came second in a personal best time of 49.04 seconds. Tunisia's Mahmoud Khaldi won gold in 48.52 to set a new world record, while Mexico's Jorge Benjamin Gonzalez Sauceda claimed bronze in 50.41 in this four-man event. Langenhoven qualified for the final when he ran the second fastest time in qualifying (49.42) on Tuesday. His silver pushed Team South Africa's medal tally up to 19 (5 gold, 6 silver and 8 bronze).